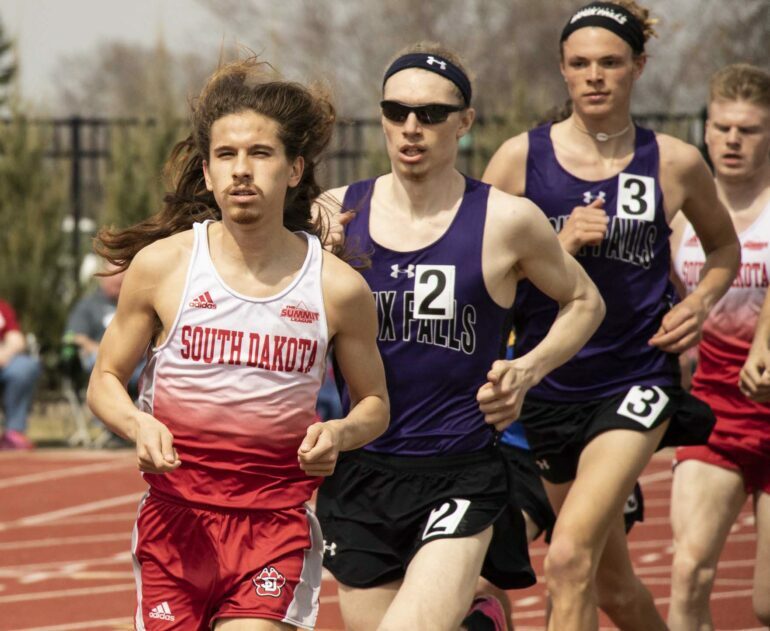 USD took first in 14 events in front of their home crowd at the South Dakota Challenge at the Lillibridge Track Complex in Vermillion on Saturday. Sophomore Macy Heinz led the charge, taking home two titles from the event. Heinz clocked a new personal best in the 800 meters at 2:10.12, while senior Mallory Fine placed second in 2:13.32. Heinz’s time ranks second in the Summit League for this season and fourth all-time in USD history, according to GoYotes. Following that performance, Heinz anchored the 4×400-meter relay team to victory in 3:48.75. Heinz was joined by Fine, senior Karina Dufoe, and junior Hannah Draayer. The team currently holds the best time in the Summit League for the season. Senior Ethan Fenchel crowned the night by breaking the school record in the hammer throw, marking at 208 feet, 9 inches. The mark ranks second in the Summit League this season and ties for 29th in the NCAA. Juniors Chris Nilsen and Ethan Bray both broke the 18 feet barrier in men’s pole vault, Nilsen making 18-8 ¾ for the victory and Bray clearing 18-1. Nilsen broke his own facility record with his mark. Junior Armand Khan achieved a nine-foot personal best in the men’s javelin to win the event at 204-11, ranking him second in program history with the attempt. Freshman Josephine Starner took home the women’s javelin at 149-11. Her mark ranks third in both the Summit League this season and in USD history. Senior Megan Billington won the 1,500 for the women with a seven-second personal record of 4:33.60, moving her to tenth in USD history and fifth in the Summit League this year. Senior Eldon Warner won the 1,500 meters for the men in 3:53.23. Sophomore Callie Henrich took first in the women’s shot put. Her outdoor best places her in third in USD history. Senior Ben Hammer won the discus at 188-6, putting him in second in the Summit League. The men’s high jump team swept the top four spots, as junior Zack Anderson placed first with a mark of 7-1 ½, breaking his own Lillibridge Track Complex record. Freshman Jack Durst finished runner-up at 6-11, while senior Deshonn Brown and sophomore Travis Larson took third and fourth respectively. The Coyotes also swept the women’s 400-meter hurdles, taking the top-three spots. Senior Haley Bruggeman won in 1:02.74 for the second fastest time in the Summit, while sophomore Holly Gerberding placed second in 1:03.03 and Draayer took third in 1:04.08. Sophomore Abby Ripperda took first in the 5,000 meters, clocking 17:19.29. Her finish was an 18-second personal best and served as her first collegiate race victory. Junior Samara Spencer took home the long jump with a mark of 19-1 ¼.
USD will split time between the Sioux City Relays in Sioux City, Iowa and the Minnesota Spring Open in Minneapolis, Minn. next weekend.